A hearty rustic bread with a crusty exterior and slightly chewy crumb worked best — tasters found that softer sandwich breads flattened out too much. For easy cleanup, cover the bottom of the Dutch oven with aluminum foil. If you don't have a nonstick grill pan you can use a nonstick skillet. Buy a rustic 8-inch loaf (often called a boule) with a good crust, and cut it into 1/2-inch slices. Adjust oven rack to middle position, and heat oven to 200 degrees. Brush oil evenly over 1 side of each slice of bread. Flip bread over and spread cranberry sauce evenly over each second side. 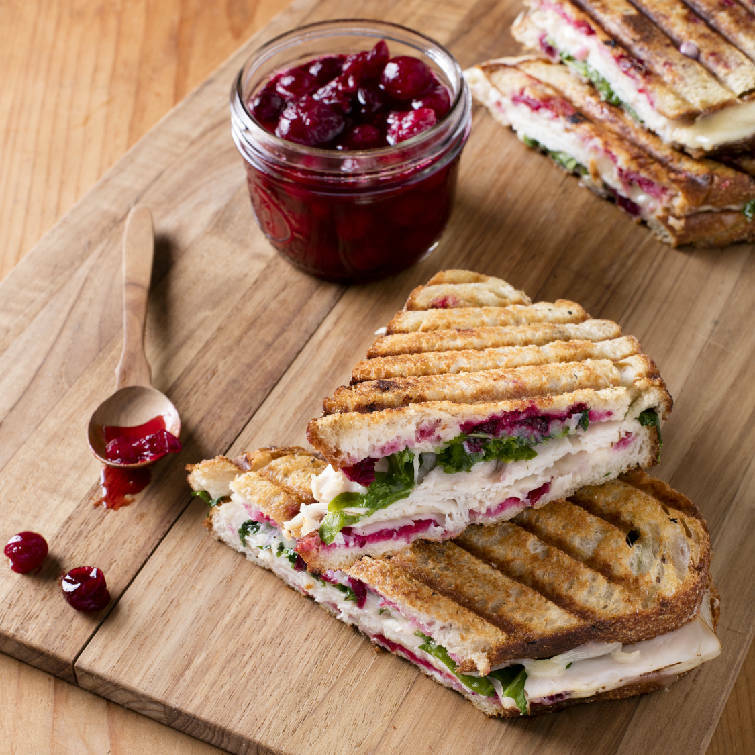 Assemble 4 sandwiches by layering ingredients as follows between prepared bread (with cranberry sauce inside sandwich): half of cheddar, turkey, arugula and remaining cheddar. Heat 12-inch nonstick grill pan or nonstick skillet over medium heat until hot, about 1 minute. Place 2 sandwiches in pan, set Dutch oven on top, and cook until bread is golden and crisp, about 4 minutes per side. Transfer sandwiches to wire rack set in rimmed baking sheet, and keep warm in oven. Wipe out skillet with paper towels, and repeat with remaining 2 sandwiches. Serve. For our classic cranberry sauce, we found that white sugar and water let the natural flavor of the fresh cranberries shine. We cooked the sauce just long enough to thicken it and break down some of the berries, but not so long that we lost all the cranberries' signature "pop." For more recipes, cooking tips and ingredient and product reviews, visit www.americastestkitchen.com. Find more recipes like Turkey Panini in "Just Add Sauce."